Fiery Gobblegut is a fiery version of Gobblegut, from Bowser Jr.'s Fiery Flotilla. He is a secret boss hidden in the Battle Belt Galaxy in Super Mario Galaxy 2, and is fought in the mission Snacktime for Gobblegut. Fiery Gobblegut is fought in the same manner as the original Gobblegut. Fiery Gobblegut has several changes to his body from his normal form. First, his skin color is now lava red instead of spring green. Also, his body now radiates lava, burning Mario at the touch and creating pools of lava when he bites the planet. He is only hurt when his bulges are spun, though the bulges are protected by surrounding fire. Fiery Gobblegut is fought in the same manner as Gobblegut. Bellyache Bulges are found at various intervals along the serpentine body of Fiery Gobblegut when he is fought in the Battle Belt Galaxy. They appear to be large pink inflamed ulcers, six of which appear along Fiery Gobblegut's body. When Fiery Gobblegut burrows into the ground, the Bellyache Bulges will become stuck in the ground, at which point the player must attempt to spin each of the six Bellyache Bulges, popping them and causing them to disappear. Mario can also perform a backflip and then spin to hit the Bellyache Bulges when they are above him. Each time one is destroyed, 10 Star Bits are released, and Fiery Gobblegut takes more damage. In effect, these Bellyache Bulges act as Fiery Gobblegut's only weakness because he cannot be damaged by any other means aside from this. When three or fewer Bellyache Bulges remain, Fiery Gobblegut begins to make fireballs rain, creating pools of lava where they land. When all six of Fiery Gobblegut's Bellyache Bulges are destroyed, he belches and explodes and Mario is granted a Power Star. 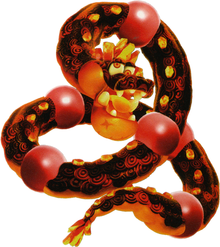 Fiery Gobblegut is one of two bosses in Super Mario Galaxy 2 accessible in a secret mission, the other one is Bugaboom. Fiery Gobblegut is similar in a way to Fiery Dino Piranha from Super Mario Galaxy, as the two are fiery versions of earlier bosses (Gobblegut and Dino Piranha respectively). This page was last edited on March 5, 2019, at 22:00.